Since 1991 PHILIP B has kept our locks looking and feeling wonderful. I have some recommendations for you to try. PHILIP B makes an amazing peppermint and avocado shampoo. It’s volumizing, clarifying, and a root booster as well. This shampoo will tingle your whole head leaving you feeling refreshed as never before. 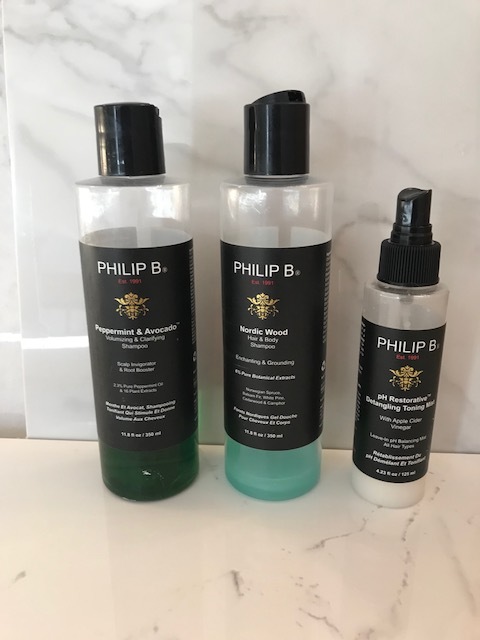 PHILIP B shampoo offers 2.3% peppermint oil and 16 Plant extracts. That includes chamomile and black walnut. Excellent shampoo. My second recommendation is PHILP B pH restorative detangling toner mist with apple cider vinegar. This is a leave-in pH balancing mist great for all hair types. this feather weight toner adjusts to the pH of tap water to give your hair a sublimely smooth, soft, glossy finish. Rich with nutrients, it detangles and obliterates frizz. Use it straight out of the shower or just spritz some on your hair during the day. Revitalize your style anytime. It’s Paraben free and color safe. Check out PHILIP B for yourself. It’s a fabulous experience for your hair and scalp!